Additional light exposure has been reported to have positive effect on growth of fish during the winter or spring periods of the year, hence various studies on the use of light intensities in fish species have been carried out over recent years (Imsland et al., 1995; Silva-Garcia 1996; Porter et al., 1999; Purchase et al., 2000; Ergün et al., 2003; Türker et al., 2005; Rad et al., 2006). It has been reported that several fish species react to longer photoperiod growth-stimulating light applications (Boeuf and Le Bail 1999), by directly improving their feed efficiency rate (Woiwode and Adelman 1991), or reducing the incidence of sexual maturation (Porter et al. 1999), so enabling redirection of energy from gonad development to muscle tissue and fat in the abdominal cavity (Hulata et al., 1985). It is well known that sexual maturation reduces flesh quality and growth and may increase mortality in fish. If growth performance can be increased by additional light application, fish can be grown faster to market size and be harvested before sexual maturation occurs (Taranger, 1993). There are several studies available on light applications by means of ways in carp. Ruchin (2004, 2006) investigated the influence of colored light on growth performance of crucian carp, and the effects of light on white blood cell count in carp, respectively. Davies et al. (1986a,b) and Davies and Hanyu (1986) worked on the effects of temperature and photoperiod on sexual maturation and spawning of the common carp. However, there is little information available on the direct relation between photoperiod regimes and growth performance in juvenile carp. Yamamoto et al. (2001) reported that shortening of light phase during the feeding trial affected feed intake of carp. Based on these reports, photoperiod is likely an important factor in terms of affecting feed intake and so the growth performance in fish. Hence, the present study was carried out in order to evaluate the effects of different light regimes on growth performance, feed intake and survival in juvenile mirror carp. The experiment was conducted in the fresh water facilities of Canakkale Onsekiz Mart University (COMU), Faculty of Fisheries, Turkey. Nine identical 50 L rectangular polypropylene tanks were used in the experiment and water volume was set to 45 L/tank. Each tank was supplied with an air stone, supported by two air pumps with two outflows each. The experimental tanks were siphoned daily to remove feces materials and new water was added accordingly. Water temperature was constant throughout the study and kept at 24 ± 1 ºC during the course of the experiment conducted for a period of 90 days. Oxygen and pH was measured every two weeks (Table 1). In the experiment performed in a triplicate design, three groups of photoperiod regimes (Light hours:Dark hours) were applied: 12 hours light:12 hours dark (12L:12D), 16 hours light:8 hours dark (16L:8D) and continuous light (24L:0D). Table 1. Water temperature, pH and oxygen levels during the experiment. Each tank with an artificial photoperiod regime was enclosed within a box made from carton and black plastic sheeting to prevent the escape of light to the surrounding tanks and enable complete isolation from natural light. Illumination was supplied with daylight fluorescent tubes (100 W) suspended 30 cm above the water surface and automatically controlled by a timer. A total of 150 mirror carp (Cyprinus carpio) used in the experiment were obtained from AKSAM (Mediterranean Fisheries Research, Production and Education Institute) in Antalya- Turkey, and transported to the freshwater facility at the Faculty of Fisheries of COMU on January 1, 2005. The fish were acclimated to the new environment for one month and fed a commercial fishmeal based carp diet (diameter: 2 mm; 280 g kg-1 crude protein, 50 g kg-1 crude lipid, and 140 g kg-1 nitrogen free extract) until the start of the experiment. On February 5, carp juveniles (mean weight of 6.14 ± 0.01 g) were randomly distributed to nine identical 50 L rectangular polypropylene tanks. First feeding was started on February 7 and the triplicate groups of juvenile carp (10 fish per tank) were reared for 90 days until May 7, 2005. Experimental fish were fed 6 daysa- week (no feed on the day of weighing as well as one day prior to weighing). Hence, absolute feeding days were 67 throughout the trial. The same diet, used during the one month acclimation period, was offered to fish during the course of the experiment. All groups were fed to satiation two times a day and 6 days-a-week by hand during the hours of natural daylight only. Hence the timer was set up so that feeding can be done at 9:00 and 16:00. Ignoring of feed was considered that fish were satiated. Feeding was monitored carefully to ensure even distribution to all experimental fish in the tanks. In addition, after siphoning the tanks to remove feces materials, new water was added the same amount that was removed. The fish were individually weighed at the beginning and at the end of the experiment. Fish were weighed in mass every 15 days during the trial with an electronic balance of high accuracy of 0.01 g. Feeding was withheld for one day prior to weighing and no feed was given to fish on the day of weighing. The results are expressed as mean ± SD. The statistical significance of differences between measured parameters was computed using analysis of variance (ANOVA, SPSS 10.0 for Windows). Duncan’s new multiple range test (SPSS 10.0 for Windows, General Linear Model - Univariate procedure, Post Hoc Tests) was applied to determine significant differences between individual treatments when ANOVA detected that factors were significant at p<0.05 level. The effects of different photoperiod regimes on growth performance, feed intake and survival are given in Table 2. No mortality was observed in the continuous light group, while a survival rate of 96.67 % was recorded in both 12L:12D and 16L:8D groups. Mean weights of the mirror carp in all photoperiod treatments increased during the 90-days trial. At the end of the experiment, fish exposed to continuous photoperiod was significantly (p<0.05) larger than those exposed to 12L:12D and 16L:8D photoperiods. Final body weight of fish maintained at 12L:12D and 16L:8D photoperiods were not significant different from each other. Mean final weights of fish exposed to the three light regimes (± SD; n = 3 tanks per treatment) were 12.71 ± 1.31, 12.72 ±1.09, and 13.67 ± 0.02 g for the fish reared under 12L:12D, 16L:8D, and 24L:0D photoperiods, respectively (Table 2). Table 2. Growth, feed efficiency and survival of mirror carp after 90 days reared under different photoperiod regimes. Weight gain of fish in the 12L:12D group was highest during the first 30 days of the trial. However the next 15 days, growth of fish decreased and returned to an increasing trend from day 45. A similar move was observed in the 16L:8D group between day 45 and day 60. In the continuous light group however, the growth trend was continuous, almost linear during the course of the experiment for 90 days. Although growth differences between fish in the continuous photoperiod (24L:0D) group and the other two groups of 12L:12D and 16L:8D began to appear from day 45 onwards, growth differences appeared to be significant at day 60 and this difference continued until the end of the experimental period of 90 days (Figure 1). 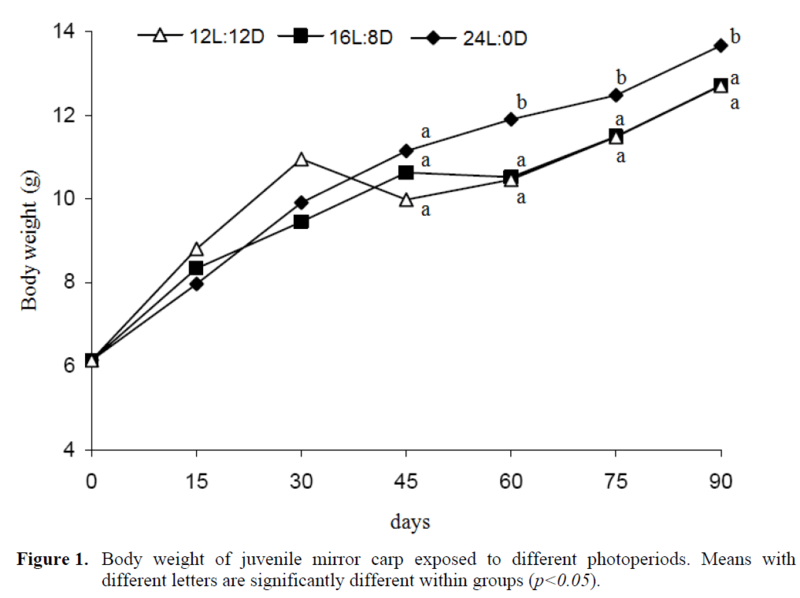 Figure 1: Body weight of juvenile mirror carp exposed to different photoperiods. Means with different letters are significantly different within groups (p<0.05). Feed intake (DFI) was not significantly (p>0.05) affected by photoperiod treatments in the present study, however, feed intake slightly increased (about 2.5 %) as continuous photoperiod was applied to the experimental fish. Feed conversion ratio (FCR) was significantly (p<0.05) affected by photoperiod treatments, and the best FCR was recorded in the continuous light regime. FCRs between the groups of 12L:12D and 16L:8D photoperiods were not significantly different (p>0.05) from each other (Table 2). The results in the present study demonstrate that growth of mirror carp was affected by photoperiod treatments and that manipulation in the light regimes can improve fish growth. Similar results have been reports in several fish species such as gilthead sea bream (Tandler and Helps, 1985), atlantic cod (Folkvord and Otterå 1993), turbot (Imsland et al., 1995), atlantic salmon (Duncan et al., 1999), rainbow trout (Ergün et al., 2003), or tilapia (Rad et al., 2006) showing that growth rate of fish can be affected by photoperiod treatments. In the present study conducted for 90 days, fish in all photoperiod treatments showed no significant differences in growth rate at day 45. By day 60, however, a significant difference (p<0.05) in growth between the continuous photoperiod and the other ones (12L:12D, 16L:8D) has been observed. The appearance of growth difference in experimental groups subjected to additional light after 60 days, might suggest that acclimatization to the rearing conditions under photoperiod regimes may have required several weeks. This result agrees with other studies conducted in salmonids; Koskela et al. (1997) reported that Baltic salmon and the brown trout require an acclimatization period of several weeks to become fully acclimatized to new rearing conditions. Ruchin (2004) evaluated the influence of colored light on different fish species (crucian carps, rotans and guppies), and demonstrated that different species of fish can respond in different ways to light quality. The author, reported that crucian carp developed better by green light and that the response in different species of fish to the light environment appears to be governed by changes in energy metabolism and hormone disproportionation. Ruchin (2006) investigated the effects of light on white blood cell count in carp and reported that high light intensity improved the physiological state of carp yearlings. Yamamoto et al. (2001) reported that the most appropriate macronutrient ratios in carp diets change with environmental conditions, and noticed that shortening of light phase during the feeding trial affected feed intake in fish. To our knowledge so far, little information is available on the relationship between photoperiod regimes and growth performance in juvenile carp. Imsland et al. (1995), found that turbot exposed to illumination of 16 and 24 hours performed a better growth than those held under 12 hours light regime. However this effect could only be seen during the first 3 month of the study, and disappeared in the next 3 to 6 month period. Türker et al. (2005) also reported improved feed intake and growth rate with increasing light hours in Black Sea turbot. Similarly, Silva-Garcia (1996) showed that weight-length ratios of fish body increased with the length of light hours applied in gilthead sea bream. Also in tilapia, Rad et al. (2006) reported better growth at longer light hours and they recorded the best growth as well as best FCR ratio in fish held under continuous photoperiod. Similarly, Gines et al. (2004) found higher daily growth in gilthead sea bream maintained at longer photoperiods than those under control treatments, and that 16L:8D had a greater effect than the continuous light application. Bjornsson et al. (1989) reported that photoperiod manipulation activates a change in plasma growth hormone and pituitary somatotrop activity during parr-smolt transformation in salmonids. This kind of hormonal activity can modify fish appetite, food conversion and growth energy requirements in fish (Donaldson et al., 1979) and light:dark cycles can regulate the feeding activity as well (Boujard and Leatherland 1992). 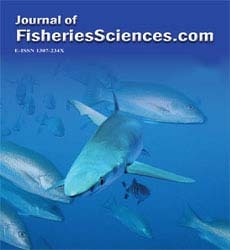 In the present study, relative growth rate of fish in the continuous light group was significantly higher than those in the shorter photoperiod groups however, feed intake was similar in all three groups and did not differ significantly, showing that the positive effects of increased light on weight gain of fish are achieved by increased feed conversion rate rather than stimulation of feeding (Woiwode and Adelman 1991). Similar to our findings, Pichavant et al. (1998) found no differences in feed intake of turbot exposed to different photoperiod regimes. Adversely, Stefánsson et al. (2002) reported higher feed intake in turbot held under 20L:4D photoperiod when compared to those maintained at 8L:16D or 12L:12D light regimes. Yamamoto et al. (2001) found that daily feed intake decreased with shortening of light phase in carp. Purchase et al. (2000) reported that the duration of the trial plays an important role in the achievement of significant effects of photoperiods on growth performance of fish. In their study on yellowtail flounder, Purchase et al. (2000) did not find any significance in growth or survival but outlined that at the end of the study, fish under shorter photoperiods were smaller than those exposed to longer photoperiods. In the present study, significant differences in growth weight between groups exposed to different photoperiod regimes, appeared by day 60 and this difference continued until the end of the experimental period of 90 days. 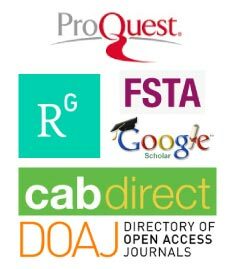 Similar to our report, Ergün et al. (2003) also reported significant growth differences between rainbow trout exposed to long (16L:8D) and continuous photoperiods (24L:0D) and those held under natural photoperiod of 10L:14D at day 60. Silva-Garcia (1996) reported that growth differences between the long photoperiod (16L:8D, 24L:0D) and the natural one appeared from day 145 of the experiment, while under the short photoperiod of 8L:16D, growth differences appeared by day 45 in gilthead sea bream. Based on the findings in the present study and those in the above mentioned reports, it might be suggested that additional light may have positive effects on fish growth in a long-term duration and photoperiod studies require more than 60 days in order to observe clear effects of photoperiod regimes. As a conclusion, our results in the present study suggest that continuous photoperiod (24L:0D) might be adequate for a better growth of mirror carp, showing that photoperiod manipulation in intensive culture systems can be easily modified for a better growth and feed conversion of fish. Bjornsson, B.T., Thorarensen, H., Hirano, T., Ogasawara, T., Kristinsson, J.B., (1989), Photoperiod and temperature affect plasma growth hormone levels, growth, condition factor and hypo osmoregulatory ability of juvenile Atlantic salmon (Salmosalar) during parr-smolt transformation. Aquaculture, 82: 77-91. Boeuf, G., Le Bail, P.Y., (1999), Does light have an influence on fish growth? Aquaculture, 177: 129-152. Boujard, T., Leatherland, J.F., (1992), Circadian rhythms and feeding time in fishes. Environmental Biology of Fishes, 35: 109-131. Davies, P.R., Hanyu, I., (1986), Effect of temperature and photoperiod on sexual maturation and spawning of the common carp: I. Under conditions of high temperature. Aquaculture, 51: 277-288. Davies, P.R., Hanyu, I., Furukawa, K., Nomura, M., (1986a), Effect of temperature and photoperiod on sexual maturation and spawning of the common carp: III. Induction of spawning by manipulating photoperiod and temperature. Aquaculture, 52: 137-144. Davies, P.R., Hanyu, I., Furukawa, K., Nomura, M., (1986b), Effect of temperature and photoperiod on sexual maturation and spawning of the common carp: II. Under conditions of low temperature.Aquacultur, 52: 51-58. Donaldson, E.M., Fagerlund, H.M, Higgs, D.A., MacBride, J.R., (1979), Hormonal enhancement of growth, in Hoar et al., eds, Fish Physiology, VIII: 455-497. Academic Press, New York. Duncan, N., Mitchell, D., Bromage, N.R., (1999), Post-smolts growth and maturation of +outseason 0+ Atlantic salmon (Salmosalar) reared under different photoperiods. Aquaculture, 177: 61-71. Ergün, S., Yigit, M., Türker, A., (2003), Growth and feed consumption of young rainbow trout (Oncorhynchusmykiss) exposed to different photoperiods. Israeli Journal of Aquaculture-Bamidgeh, 55: 132-138. Folkvord, A., Otterå, H., (1993), Effects of initial size distribution, day length and feeding frequency on growth, survival and cannibalism in juvenile Atlantic cod (Gadusmothua L.). Aquaculture, 114: 243-260. Gines, R., Afonso, J.M., Argüello, A., Zamorano, M.J., López, J.L., (2004), The effects of long-day photoperiod on growth, body composition and skin colour in immature gilthead sea bream (Sparusaurata L.). Aquaculture Research, 35: 1207-1212. Hulata, G., Wohlfarth, G., Moav, R., (1985), Genetic differences between the Chinese and European races of the common carp, Cyprinuscarpio L. IV.Effects of sexual maturationon growth patterns. Journal of Fish Biology, 26: 95-103. Imsland, A., Folkvord, A.F., Stefansson, S.O., (1995), Growth oxygen consumption and activity of juvenile turbot Scophthalmusmaximus L. reared under different temperatures and photoperiods. Netherlands Journal of Sea Research, 34: 149-159. Kissil, G.W., Lupatsch, I., Elizur, A., Zohar, Y., (2001), Long photoperiod delayed spawning and increased somatic growth in gilthead seabream (Sparusaurata). Aquaculture, 200: 363-379. Koskela, J., Pirhonen, J., Jobling, M., (1997), Variations in feed intake and growth of Baltic salmon and brown trout exposed to continuous light at constant low temperature. Journal of Fish Biology, 50: 837-845. Pichavant, K., Person-Le-Ruyet, J., Sévère, A., Le Roux, A., Quéméner, L., Boeuf, G., (1998), Capacitésadaptatives du turbot (Psetta maxima) juvénile à la photopériode. Bulletin Francais de la Pecheet de la Pisciculture, 350–351: 265–277. Porter, M.J.R., Duncan, N., Mitchell, D., Bromage, N.R., (1999), The use of cage lighting to reduce plasma melatonin in Atlantic salmon (Salmosalar) and its effects on the inhibition of grilsing. Aquaculture, 176: 237-244. Purchase, C.F., Boyce, D.L., Brown, J.A., (2000), Growth and survival of juvenile yellowtail flounder Pleuronectesferrugineus (Storer) under different photoperiods. Aquaculture Research, 31: 547-552. Rad, F., Bozaoğlu, S., Gözükara, S.E., Karahan, A., Kurt, G., (2006), Effects of different long-day photoperiods on somatic growth and gonadal development in Nile tilapia (Oreochromisniloticus L.). Aquaculture, 255: 292-300. Ruchin, A.B., (2004), Influence of colored light on growth rate of juveniles of fish. Fish Physiology and Biochemistry, 30: 175–178. Ruchin, A.B., (2006), Effect of Light on White Blood Cell Count in Carp CyprinuscarpioL.. Biology Bulletin, 33: 517–520. Silva-Garcia, A.J., (1996), Growth of juvenile gilthead seabream (Sparusaurata L.) reared under different photoperiod regimes. Israeli Journal of Aquaculture-Bamidgeh, 48: 84- 93. Stefánsson, M.Ö., FitzGerald, R.D., Cross, T.F., (2002), Growth, feed utilization and growth heterogeneity in juvenile turbot Scophthalmusmaximus (Rafinesque) under different photoperiod regimes. Aquaculture Research, 33: 177-187. Stefansson, S.O., Naevdal, G., Hansen, T., (1989), The influence of three unchanging photoperiods on growth and parr-smolt transformation in Atlantic salmon, Salmosalar. Journal of Fish Biology, 35: 237-247. Tandler, A., Helps, S., (1985), The effects of photoperiod and water echange rate on growth and survival of gilthead sea bream (Sparusaurata, Linnaeus) from hatching to metamorphosis in mass rearing systems. Aquaculture, 48: 71-82. Taranger, G.L., (1993), Sexual maturation in Atlantic salmon, Salmosalar L.: aspects of environmental and hormonal control, Dr. scient. thesis. Department of Fisheries and Marine Biology, University of Bergen, Norway. Türker, A., Yigit, M., Ergün, S., (2005), Growth and Feed Utilization in Juvenile Black Sea Turbot (Psettamaeotica) under Different Photoperiod Regimes.Turkish Journal of Veterinary and Animal Sciences, 29: 1203- 1208. Woiwode, J.G., Adelman, I.R., (1991), Effect of temperature, photoperiod, and ration size on growth of hybrid striped bass x white bass. Tansactions of the American Fisheries Society, 120: 217-229. Yamamoto, T., Shima, T., Furuita, H., Shiraishi, M., Sanchez-Vazquez, F.J., Tabata, M., (2001), Influence of decreasing water temperature and shortening of the light phase on macronutrient self-selection by rainbow trout Oncorhynchusmykiss and common carp Cyprinuscarpio. Fisheries Science, 67: 420–429.